Start your day off right. Sign up to recieve the Stillspeaking Daily Devotional delivered each morning to your email inbox. In 2004, it was concluded that there was a present and real need for genuine welcome, openness and acceptance for all within the church. The United Church of Christ responded to this call of extravagant welcome and radical hospitality with a new branding campaign to proclaim to the world that any could find a home in the UCC. To date, more than 2,500 churches have chosen to formally participate in the God is Still Speaking campaign. As that number continues to grow, the UCC continues to balance religious tradition with new ideas for religion that is relevant. The Stillspeaking Ministry continues to provide resources that enable all settings of the church to proclaim the good news of extravagant welcome. Together under one collective identity, we can enthusiastically support and proudly life up that the UCC is a welcoming, justice-minded Christian community. -where together we grow a just and peaceful world. Become a Stillspeaking Voice! 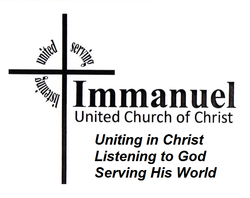 Share you testimony with Immanuel on the Immanuel Voices blog.